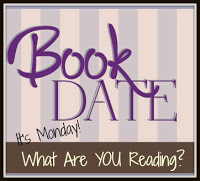 Book By Book: It's Monday 4/30! What Are You Reading? Whoa. How did it get to be the end of April already? And the temperature was in the 30's this morning! Of course, the forecast says we'll be close to 90 by the end of the week, so I guess April was still winter, and May will be summer - what happened to spring? OK, enough weather ranting. Last week was a good productive week. I got lots of writing done - both here on the blog and for my freelance work. I was catching up after our vacation and also getting ready for another trip this week. I will be driving to Vermont at the end of the week for Booktopia 2018! It's an amazing book event that my mom and I enjoy most years, when we can manage it - there's still time to sign up, if you want to join the fun! I can't wait to spend time with my mom, see our old friends from previous Booktopias, meet the authors and spend time with them...and talk books ALL weekend! I finished The Anatomy of a Miracle by Jonathan Miles, a Booktopia selection. It's a novel written as if it were an in-depth investigative report of a true story, about a young man on the Mississippi Gulf Coast who was paralyzed in Afghanistan and suddenly just stands up from his wheelchair and walks. The book delves into many different aspects of the story - his doctor at the VA, the Catholic church's investigation into whether this constitutes a miracle, a reality TV show made about him, and the backstory of his life before. It was completely unique and very good - insightful and funny, about what it means to live in our modern world. Now, I am reading another Booktopia book, All the Beautiful Lies by Peter Swanson. I chose this mystery/suspense novel next because I was in the mood for something fast-paced - and this really fit the bill! I have been staying up way too late each night reading this story about a recent college graduate who returns to his hometown in Maine when his father dies only to find his much-younger stepmother coming onto him and a mysterious young woman wandering around town who seems to be involved somehow. The lies and secrets pile up in this suspenseful and somewhat creepy novel. I hope to finish it today - it's been a fast, compelling read! My husband and I finished listening to The Woman in the Window by A.J. Finn, which we started on our road trip. It's sort of a modern version of the Hitchcock movie Rear Window. In this case, it features a woman named Anna with agoraphobia who hasn't left her house in 11 months. She amuses herself in part by watching her neighbors from her window, and one day she sees a horrible crime. She tries to report it to the police, but the people involved deny it happened and no one believes her, due to her unstable mental condition, loads of medications, and a heavy drinking habit. Lots of suspense over whether it really happened or not! We enjoyed it, and it kept surprising us. Now, I am listening to a middle-grade audio book, Posted by John David Anderson, about a middle school that bans cell phones. A boy nicknamed Frost and his three misfit friends start a trend of using sticky notes to communicate, and a new girl named Rose changes things for all of them. So far, it's warm and funny and very enjoyable. My husband, Ken, is reading a novel I gave him for Easter (books for all occasions here! ), Fifty Mice by Daniel Pyne. It's a thriller with an intriguing plot: a man has been put into Witness Protection and moved to a community on Catalina Island in CA, but he doesn't remember what dangerous information he knows. Our son, Jamie, 23, is still reading the Wheel of Time series by Robert Jordan. He is on book 7, A Crown of Swords. He loves this epic fantasy series. He has been slammed with make-up work and job hunting, but he has less than a month to go to graduation! Blog posts from last week - a catch-up week! FREE Audiobooks - SYNC Summer 2018 Begins! - free audiobooks all summer - still time today to grab the two for week 1! I'm missing those lazy vacation days with plenty of reading time! I really enjoyed reading Posted -- hope you like the ending! The Anatomy of a Miracle sounds very fascinating. I think reading it would make me want to read about real accounts of these occurrences. Thanks for sharing, Sue. Have a wonderful week! Oooh - now you've got me intrigued! I'm really enjoying Posted so far. I really enjoyed The Woman in the Window...and I am on hold at the library for All the Beautiful Lies. Oh, good! You'll like it - I read it in record time - good suspense. I grabbed my SYNC audiobooks this week. I've already read A Study in Charlotte but thought it would be fun to listen to. Come see my week here. Happy reading! Oh, good - I can;t wait to listen to it! Thank you for your great descriptions about your books! I must improve on that! The Woman int the Window has been added to my Goodreads "want to read" list! Thank you! Thanks for the compliment! Hope you enjoyed Woman in the Window! Hope you enjoy Vermont and the book event. From reading books Vermont has always sounded appealing although cold in winter. Love the premise of the middle grade sticky notes book. Thank you for your kind words on my blog re my sister. So appreciated. Thanks, Kathryn! Vermont is a BEAUTIFUL state - you are right - but yes, best in the warmer months! Thinking of you. I enjoyed Posted and have John David Anderson's new book, Granted, in my pile to get to. Oh, I am behind then! I always have a backlog of audios. I;m enjoying Posted so will have to look for Granted, too! It feels like I don't have time for those first three you shared, but they all sound very good. I will share with those I know love thriller/mysteries. I have Posted on my list, hope I can find time for it sometime. Thanks, Sue! I;m enjoying Posted on audio very much - the 2 mystery/thrillers were both very quick reads - fast-paced! I am in between books today, but think I'll read one more work book before starting a TLC book later this week. Oh, I just love getting to choose a new book! Especially nice when you have no pressing obligations for reviews ot book groups and can choose freely! I'm enjoying Posted very much! Yes, lying in a chair by the campfire reading is sounding pretty good right now! I loved The Woman in the Window it kept me up late, late into the night. One of those books you just can’t put down. My son has read the whole wheel of time series three times. I read it on his recommendation and was quickly hooked. Yes, it kept us captivated, too! Wow, your son sounds a lot like my son - if he hasn;t read a series in a while and gets a new book in it, he will re-read the entire series - sometimes multiple times! He is loving Wheel of Time.